Why do all animals have the same skeleton? Thread: Why do all animals have the same skeleton? #1 Why do all animals have the same skeleton? This has always fascinated me. Apart from insects and snakes, all animals have the same skeleton, the only differences being the relative sizes of the various bones. So an elephant and a dolphins skeletons have the same elements, but the dolphins' hips and back legs are merely tiny vestigial structures, and the elephants skull is extensively modified to accommodate the trunk and tusks. I know that some aquatic dinosaurs had 6 or 7 "fingers" in their front fins. Has there been no other skeleton form on earth, and if not do we know why? Is 'ours' just so successful that everything else died out. Have no fossils of other skeleton forms ever been found? Sorry if this has already been discussed elsewhere. Can you help me with debunking "Reptilians"? Could this be our true origins? Could 'subtle energy' (chi, life force, etc) be 'diffuse magnetism'? Is there a specific cause for the huge intellectual jump where humans came into existence during evolution? insects are not the only animals with external skeletons. Why are snakes excluded from this, as they also have a pelvis, especially in some fossil groups. There were no aquatic dinosaurs, there were Mosasaurs, Plesiosaurs, and Pliosaurs (plus a couple smaller groups) none of which were part of Dinosauria. The dolphin skeleton is very different from the emu skeleton. Both are very different from the sea turtle skeleton. All are different from the ray/skate skeletons. MrMojo1, Flick Montana and mikepotter84 like this. a. OK, yes lobsters and crabs too have external skeletons - I was not saying they didn't - but surely you understood my point? 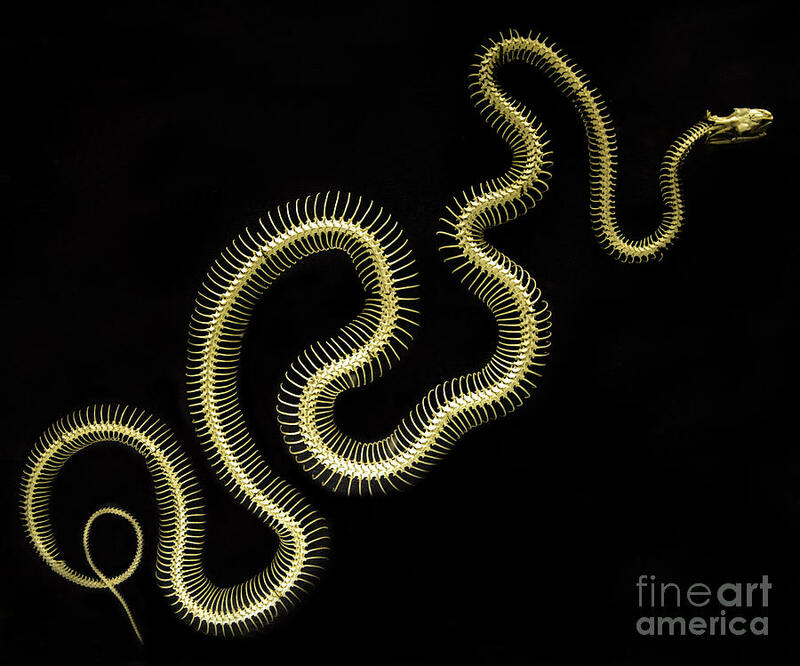 b. OK, I was not aware that snakes had a vestigial pelvis, but don't they have many more vertebrae and ribs than the mammals, so surely it's a different skeleton, or is it a modification of ours? c. Aquatic dinosaurs, OK, but you surely knew what I meant? let's not be a playground bore here. d. Well this is exactly my point. A dolphin does seem very different to an emu and a sea turtle, but their skeletons have all the same bones, just that each bone is a different size or fused with others to specialize the specific role of the animal. The emu's hand and finger bones have grown to very different sizes to the dolphin's in order to form wings, (albeit an emu can't fly any more). The skate is interesting - it has those bones in it's side flanks. Are these modified ribs, or does it have a different, unique skeleton to ours? I don't know what the skeleton of a ray is like. A bat and a giraffe too each have the same basic skeleton, but the bat has very long thin finger bones to form wings, and the giraffe has very long neck vertebrae, but still only seven of them. e. I realised that we must have all come form a common ancestor, but my question was why? Why are there not any other animals with different skeletons on earth either alive today or in the fossil record? Just to be clear; when I say different, I mean completely different, not just different sized elements of the same basic 206 bone structure. How come no other skeleton types or designs evolved? I think the answer involves the basic process of evolution. Once a significant advance is made the carriers of that genetic variation out compete any alternative ones. All vertabrates are decended form one common ancestor with a skull, vertral column, and four limbs. The number of digits on the limbs sees to be more variable. There is probably no particular environmental drawback to having 6 toes. Lynx_Fox and jrmonroe like this. <snip> - but surely you understood my point? <snip> OK, but you surely knew what I meant? let's not be a playground bore here. It's a science forum. Accuracy is important. Expansion of knowledge is important. I'm sorry you feel Paleoichneum's "couple of points" were picky. The post garnered three or four Likes, so apparently others disagree with your assessment. Paleoichneum was not trying to put you down, but add to your knowledge. Your declared fascination with the subject might have been expected to generate gratitude for all of the post, not just parts of it. That's my two cents worth. I realised that we must have all come form a common ancestor, but my question was why? Why are there not any other animals with different skeletons on earth either alive today or in the fossil record? I thnk sealeaf has probably nailed this. Once a major success evolves it is tricky for any other solutions to get a look in. It's the same reason new forms of life stand little or no chance of emerging by abiogenesis. The molecules in any pecursor system would simply be food for one or other of our relatives. In Norfolk it is almost mandatory. I do understand your points, but i was pointing out that its a fair bit more complicated then you are suggesting. Most lizards and fish have many more vertebra then mammals, so all you need do is remove the pelvis and you have a snake. They are all adaptations of the general chordate body plan. of which the amphibians and fish are much closer to the ancestral from then lizards so going with the 206 count is not really the right starting point. Looking at early Devonian fish and early Carboniferous amphibians show that generally speaking mammals have a simplified modified version of the older plans. Lynx_Fox and Ascended like this. Point taken, but on here there are many posts written by folk who cannot spell, cannot correctly capitalize, or structure sentences. They don't get criticized for this, yet I get criticized for not knowing the correct word. Every "book about dinosaurs" I opened as a kid showed pictures of animals on the land and in the sea, so I think that if I called them 'aquatic dinosaurs' you would know what I meant. ...was a question, (well, four questions). Simple answer (to the first part) would have been yes, with pictures of some examples. Thank you. No need for the put downs. Is the middle one a skate/ray? The chordate plan was successful because it included a brain and it allowed for the development of an internal support (spinal chord), increasing the potential size of the organism. Variations to the plan are just adaptations to different environments. I'm not trying to be demeaning, just trying to inform. Ok, fair enough. I probably didn't phrase my question very clearly. It's just that you got my hackles up because you spent 4 lines trashing me before even starting to answer my (badly put) question. 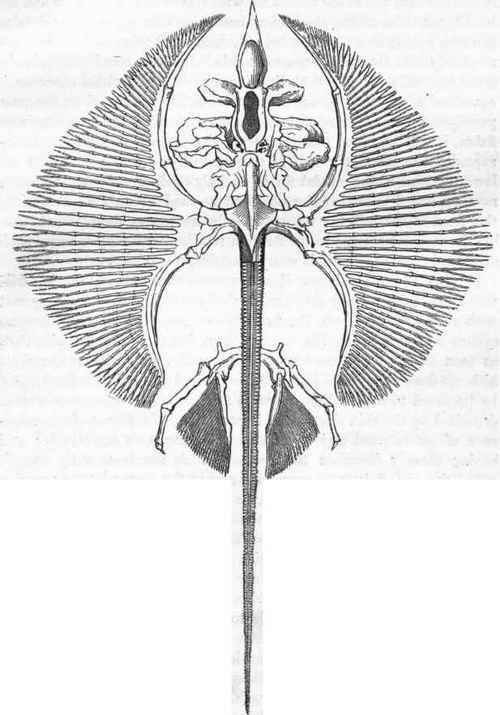 The skate skeleton certainly looks like an "alien", and completely different. Is it actually different to 'ours' or just very extensively modified? Paleoichneum did not trash you. In fact, s/he never mentioned you at all. If you feel personally insulted by someone correcting your posts, then you are going to have a hard time on a discussion forum. I did not say anything about you, or trash you. I pointed out inaccurate information that was seemingly used in the opening question. I think one of major things to do is start thinking of us as modified fish, and not of everything else as modified humans. So, from what you say, am I right in thinking that all animals with internal skeletons were/are derived from the same basic skeletal form? If so, I find that very interesting indeed. Has no other internal skeleton form ever appeared on earth - only derivations of the same one? Almost all basic animal body plans are derivitives of one of the body plans which emerged in the early to middle Cambrian. After that point, major nodes of modification radiation have occured in each body plan over the eons, while several body plans, such as the marrellomorph and dinocaridid arthorpods, and the hallucigeniid ?onychophorids? have gone extinct. There really has been no other opportunity or major extinction event large enough with the right conditions for a non-chordate endoskeleton to emerge. The skeletal form here on earth is clearly a very successful arrangement. I suppose the planet defined, it in a way? I wonder if the skeletal form on other planets would be the same or completely different? For example, our upper limbs are connected via shoulder blades which 'float' on top of our rib cages, held in place with muscle, cartilage and the collar bones etc. This has always seemed to me to be a bit of an "afterthought", but it obviously works alright. Is it the most efficient way of doing it though - perhaps this arrangement gives a high degree of shock absorbancy? It most likely is not the most efficient. Cats have very small collarbone that dont do much, and in combination with the looser binding of the skeletal elements can usually squeeze through a space they can fit their head through, something the vast majority of us cant do. Ah, well that could be the reason for movable upper limb joints right there. If I was designing a skeleton. I would probably locate the upper limbs to the backbone with a more positive joint - onto the vertebrae - via something similar to a pelvis like the lower limbs are. But there must be some good reason for the current loose arrangement to have evolved.
. But there must be some good reason for the current loose arrangement to have evolved. Well, shoulder flexibity makes it easier to reach overhead, to throw things and to use your arms for attack or defense. I think that's one part of the human body plan that works quite well. Well, shoulder flexibity makes it easier to reach overhead, to throw things and to use your arms for attack or defense. Throwing helped us to do more hunting. "The ability to throw at very high speeds is unique to humans. We can throw much faster than our closest living relative - the chimpanzee - which can only reach speeds of 20mph compared to 90mph that many professional athletes can reach." "The ability to throw was one of a handful of changes that enabled us to become carnivores, which then triggered a host of changes that occurred later in our evolution," Lieberman said. "If we were not good at throwing and running and a few other things, we would not have been able to evolve our large brains, and all the cognitive abilities such as language that come with it. If it were not for our ability to throw, we would not be who we are today." It also explains why women can't throw! Yeah, could be, might be.... But we can kick very well and very strongly, with limbs positively connected to our spines. It doesn't explain why "women can't throw" though. Women/girls do throw differently to guys, but I think that is due to culture/training/expectations, not due to different skeletons, so no there's need to be sexist really, is there ? But has kicking ever been used as a hunting technique? No probably not, fair point - I've got a really funny image in my mind now of a group of cavemen with no weapons running around trying to kick a buffalo or an antelope !! I believe nature has tried (metaphorically) several different building instructions. The Fern, one of the oldest organisms on earth, is build on fractal instructions and all organisms display at least partial fractal organization (it is simple to duplicate) . But its very rigidity of duplication prevented moving parts. But this particular method of duplication is not used in later (higher) modern lifeforms. The fern is worthy of great respect. It's oooold. Apparently nature found a way to create a fundamentally adaptable skeletal structure in addition to the fractal functionality found in the systems of almost every living thing on earth. Last edited by Write4U; July 14th, 2013 at 06:38 PM. There are many things that are older then ferns, in fact all phylums of life are older. The oldest macroscopic life we have fossils of are algae chains in the form of stromatolites. After that there are the Edicarian biota organisms with various symmetries of both the radial and the bilateral types. Fractal is not a symmetry in general. Fern fiddle heads are bilaterally symmetrical while pinecones are either radial. I don't think worms have the same skeletons as turtles. But I think all others are pretty much the same. Have you studied fractals? They may well be a fundamental property of the universe. Worms have no skeleton, they are invertebrates, but turtles have both endo and exoskeletons. Other invertebrates are slugs and more complex lifeforms like the cuttlefish. The cuttlefish belongs to the Sepiida class which also includes the Squids, the Octopus and the Nautiluses. Insects mostly have an exoskeleton for utility and defense. But most endoskeletons (internal) do seem to have similar features even in a great variety of adaptations. Evolution has kept the things that are functionally sound and incorporated them into the specific environmental adaptions. Perhaps more evidence of common ancestry? While fractals may be present in visible form on animals, they are not a system of symmetry as you suggested in your post. And I will not you yourself have used may, which indicated there is reasonable doubt still. hum, that last sentence lacked a little symmetry. I believe I have provided sufficient examples to support the thrust of my posts. I passed on what I felt might be pertinent and informative (in a small degree) to the subject matter. you provided examples of fractals present in systems of symmetry, but the original post was incorrect in asserting that fractals them selves were a system of symmetry. It was also incorrect in teh assertion of ferns being some of the oldest lifeforms known. passing on tidbits is good, passing on factually correct tidbits is much preferred. After rereading my own posts, I feel no need to edit or change any of the text of my posts. Perhaps you need to reread my posts also, you may discover that you are assuming things I did not actually say. I am all for accuracy when making specific claims. I made the claim that ferns are an old species (and supported it with a link), not the oldest living thing. I never said that. It seems you missed the thrust of my suggestion of the use of fractal structures, symmetrical or not, in nature. A fractal system allows for simple genetic instructions, but is limited in complexity and not very suitable to the development of motion (and supported that claim with a link). Are you claiming these claims are false? If so, I would appreciate a suggestion of a link for further study. If not, then your critiques often seem dismissive of the entire post. It is discouraging and stifles free discussion, to say the least. That might be the cutest fish ever! Seems reasonable to me that the vertebrates have a common ancestor and that change to how many vertebrae or how many digits or the relative growth rates of specific bones - including not growing at all - are smaller genetic steps than coming up with whole new structures. RedPanda - just out of curiosity - why the image of a thylacine (Tasmanian tiger) instead of, say, a Red Panda? Technically, cuttlefish aren't fish at all, but mollusks—soft-bodied animals without a spine a group that includes snails and clams. But these animals have no outer shell. They're a kind of cephalopod, along with their more famous cousins, octopus and squid. Cuttlefish are marine animals of the order Sepiida. They belong to the class Cephalopoda, which also includes squid, octopuses, and nautiluses. I hope that clears any omissions on my part. And as to the possible importance and functionality of fractal system and structures, you may want to read up on CDT (Causal Dynamic Triangulation). I am glad you make me work and prove my posts from memory to be correct. Last edited by Write4U; July 17th, 2013 at 02:43 AM. Yes this is more accurate, thanks. And it looks like CDT is very large scale physics, doesn't seem to be supported by many researchers and does't seem to have any interaction with biology. does't seem to have any interaction with biology. Please look and read up on the fern. If I recall it was my first witness. Newly uncovered fossils reveal in extraordinary clarity the strangeness of the Earth's earliest complex life. The finds show that the organisms were assembled in fractal patterns from frond-like building blocks. They were unable to move and had no reproductive organs, perhaps reproducing by dropping off new fronds. The creatures, which were neither animals or plants, are called "rangeomorphs". They first appeared on the ocean floor 575 million years ago, after the last global glaciation, and were among the first of the soft-bodied creatures in the Ediacaran period. This biota survived until 542 million years ago, when modern animals diversified rapidly in the Cambrian explosion and most Ediacaran species vanished. Until now, almost all Ediacaran fossils were squashed flat, and the few that were not were poorly preserved. This led to debate over whether the poor preservation obscured links to later life, or if the Ediacaran organisms were in fact a failed experiment in evolution that simply became extinct. The newly unearthed fossils, from Newfoundland, Canada, were preserved three-dimensionally in fine-grained mud by a "one-in-a-million" streak of luck, says Guy Narbonne of Queen's University in Kingston, Ontario. Just after a mud flow entombed the organisms, a nearby volcano erupted, covering it with a thick ash protective ash deposit. Later, the bed escaped the strain that altered most of the rock in the region. Now weathering is exposing them so "they basically pop out of the rock," Narbonne told New Scientist. "You are seeing what they looked like when they were alive." That exceptional preservation is cracking the mystery of Ediacara. In some spots the surface has eroded and "we see for the first time what was inside an Ediacaran fossil," Narbonne says. Each frond element, a few centimetres long, was made of many tubes held up by a semi-rigid organic skeleton. The frond elements had branches which themselves had branches, a classic fractal structure. Frondlets assembled themselves like building blocks to make larger living structures attached to the sea floor. Narbonne found rangeomorphs assembled in several different shapes, which he believes filtered food from different levels of the water column, as well as isolated free-living frondlets. The fractal patterns look complex, but Narbonne says their self-similarity means that very simple genomes - expected in early organisms - would suffice both to assemble individual frondlets and to control their assembly into larger structures. That would explain why the rangeomorphs evolved first. They accounted for over 80% of fossils early in the Ediacara period, when there were no mobile animals or traces of burrows. But they declined as more mobile animals evolved, apparently unable to compete, or perhaps being eaten themselves. "This discovery is a real eye-opener," says Whitey Hagadorn of Amherst College, Massachusetts. But he adds that what will be "really exciting" are the follow-up papers that analyse the fossils in detail and try to explain the Ediacara organisms. I hope this closes the side issue of the fractal structure in early organisms and why this would be a natural phenomenon. Last edited by Write4U; July 18th, 2013 at 07:02 AM. I agree that some organisms, including many many modern ones display fractal growth structures, as do many non-organic materials. I have already read the old New Scientist article, but it doesnt make major claims overall. its mostly the article writers musing. As someone working on a paleobotany degree i am very familiar with ferns. Also with the older Silurian protoplants, which do not show a fractal pattern, and with the many Edicarian organisms that show no fractal patterns. Why don't we see many animals mass murdering other animals?